1. Dissolve yeast in lukewarm water, stir and set aside. 2. In a large bowl, combine flour, 1 tsp salt, sugar and dissolved yeast, knead until a smooth dough. Oil a medium bowl, place the dough into the bowl, brush the top with oil. 3. Cover and let it rise for 1 h.
4. Preheat oven to 200c/400f and line a baking sheet with parchment paper. 5. On a lightly floured surface, knead the dough once more and divide into 10 pieces. 6. 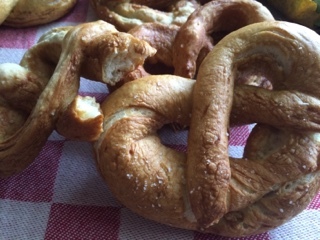 Roll each piece into longs strips and fold into a pretzel shape. 7. Add 1 tsp salt to a medium saucepan o boiling water, turn down to a simmer and add baking soda. 8. 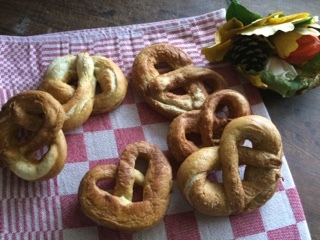 Slide the pretzel into the simmering water with a slotted spoon. Simmer for 1 to 2 minutes. 9. 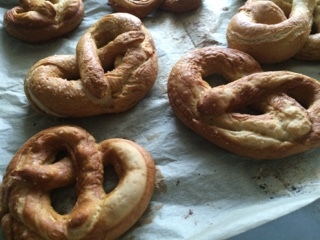 Place the pretzels on a lined baking sheet, sprinkle with coarse salt. 10. Place in preheated oven and bake for 10-15 minutes until deep brown.